Harris has been selected to develop an integrated core processor for the F-35 aircraft through a partnership with Lockheed Martin. ICP will work to process data from the fighter aircraft’s communications, sensors, electronic warfare, control, guidance and avionics systems, Lockheed said Thursday. The F-35 prime contractor expects Harris to deliver the processors beginning in 2023 for integration into lot 15 aircraft production units. The system is designed to increase the jet’s computing performance by up to 25 times and employ an open architecture intended to accommodate future updates. 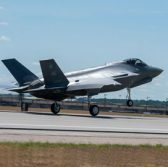 Lockheed noted ICP is a component of F-35’s Technology Refresh 3 modernization that also covers panoramic cockpit display electronic and memory system upgrade efforts.